The work to transform society involves two parallel paths: resisting harmful systems and institutions and creating new systems and institutions to replace them. Our focus in this article is on positive work that people are doing to change current systems in ways that reduce the wealth divide, meet basic needs, ensure sustainability, create economic and racial justice and provide people with greater control over their lives. When we and others organized the Occupation of Washington, DC in 2011, we subtitled the encampment ‘Stop the Machine, Create a New World’, to highlight both aspects of movement tasks — resistance and creation. One Popular Resistance project, It’s Our Economy, reports on economic democracy and new forms of ownership and economic development. Mahatma Gandhi’s program of nonviolent resistance, satyagraha, had two components: obstructive resistance and constructive programs. Gandhi promoted Swaraj, a form of “self-rule” that would bring independence not just from the British Empire but also from the state through building community-based systems of self-sufficiency. He envisioned economic democracy at the village level. With his approach, economics is tied to ethics and justice — an economy that hurts the moral well-being of an individual or nation is immoral and business and industry should be measured not by shareholder profit but by their impact on people and community. Today, we suffer from an Empire Economy. We can use Swaraj to break free from it. Many people are working to build a new economy and many cities are putting in place examples of economic democracy. 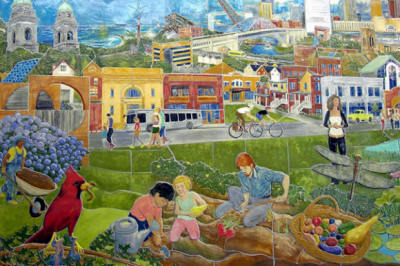 One city attempting an overall transformation is Cooperation Jackson in Jackson, Mississippi. 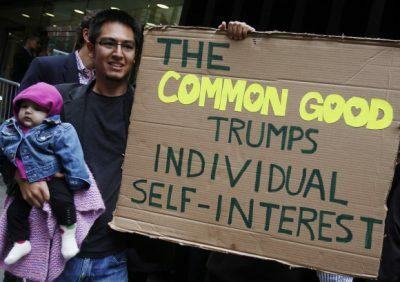 In his new book, Out of the Wreckage: A New Politics for an Age of Crisis, George Monbiot argues that a toxic ideology of greed and self–interest resulting in extreme competition and individualism rules the current economic and political culture. It is built on a misrepresentation of human nature. Evolutionary biology and psychology show that humans are actually supreme altruists and cooperators. Monbiot argues that the economy and government can be radically reorganized from the bottom up, enabling people to take back control and overthrow the forces that have thwarted human ambitions for a more just and equal society. We are in the midst of writing that new story as people experience the injustice of the current system with economic and racial inequality, destruction of the environment and never ending wars. Indeed, we are further ahead in creating the new Restoration Story than we realize. New research from the University of Wisconsin–Madison’s Center for Cooperatives (UWCC) has found there are 39,594 cooperatives in the United States, excluding the housing sector, and there are 7 million employer businesses that remain “potential co-op candidates.” These cooperatives account for more than $3 trillion in assets, more than $500 billion in annual revenue and sustain nearly two million jobs. This May, the Office of Management and Budget approved including coop questions in the Economic Census so that next year the US should have more accurate figures. The massive growth of cooperatives impacts many segments of the economy including banking, food, energy, transit and housing among others. 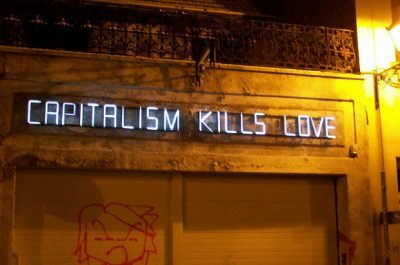 In cooperatives, workers or consumers decide directly how their business operate and work together to achieve their goals; it is a culture change from the competitive extreme capitalist view dominated by self-interest. In Energy Democracy: Advancing Equity in Clean Energy Solutions, editors Denise Fairchild and Al Weinrub describe energy cooperatives that are creating a new model for how we organize the production and distribution of energy, which is decentralized, multi-racial and multi-class. First, people come together across class and race to make change in their community by using their power as investors, workers, consumers, and citizens ready to take action together. Then, they work together to build community-owned enterprises with local capital and local jobs to serve local energy needs. It’s a proven strategy for making a real difference. In Lancaster, CA, the mayor has turned the town into a solar energy capital where they produce power not just for themselves, but also to sell to other cities. They are also moving to create manufacturing jobs in electric buses, which more cities are buying, and energy storage. Research finds that rooftop solar and net-metering programs reduce electricity prices for all utility customers, not just those with solar panels. The rapid growth of rooftop solar is creating well-paying jobs at a rate that’s 17 times faster than the total U.S. economy. Rooftop solar, built on existing structures, such as homes and schools, puts energy choices in the hands of customers rather than centralized monopolies, thereby democratizing energy. Including housing cooperatives would greatly increase the number of cooperatives. According to the National Association of Housing Cooperatives, “Housing cooperatives offer the more than one million families who live in them several benefits such as: a collective and democratic ownership structure, limited liability, lower costs and non-profit status.” Residents of a mobile home park in Massachusetts decided to create a housing cooperative to put the residents in charge of the community when the owner planned to sell it. Related to this are community land trusts. A section of land is owned in a trust run as a non-profit that represents the interests of local residents and businesses. Although the land is owned by the trust, buildings can be bought and sold. The trust lowers prices and can prevent gentrification. The wealth divide has become so extreme in the United States that nearly half of all people are living in poverty. A small UBI would provide peace of mind, financial security and the possibility of saving money and building some wealth. A report by the Roosevelt Institute, this week, found that a conservative analysis of the impact of a UBI of $1,000 per month would grow the economy by 12.56 percent after an eight-year implementation, this translates to a total growth of $2.48 trillion. Another major area of economic democracy is the finance sector. At the end of 2016 there were 2,479 credit unions with assets under 20 million dollars in the United States. Members who bank in credit unions are part of a cooperative bank where the members vote for the board and participate in other decisions. North Dakota is the only state with a public bank, and it has the most diverse, locally-owned banking system in the country. Stacey Mitchell writes that “North Dakota has six times as many locally owned financial institutions per person as the rest of the nation. And these local banks and credit unions control a resounding 83 percent of deposits in the state, more than twice the 30 percent market share such banks have nationally.” Public banking campaigns are making progress in many parts of the country, among them are Oakland, Los Angeles, Philadelphia, Santa Fe, and other areas. When crises occur, no matter what their cause, people can work together cooperatively and outside of slow and unresponsive state systems to meet their needs. This is happening in Athens, Greece, which has been wracked by financial crisis and austerity for years. People have formed “networks of resistance” that meet in community assemblies organized around needs of the community, such as health care and food. They started with time banks as a base for a new non-consumer society. Similar efforts are underway in Puerto Rico following the devastation of Hurricane Maria. A group called El Llamado is coordinating more than 20 mutual aid efforts, and providing political education and support for self-organizing at the same time. We survived despite being weaker and slower than both our potential predators and most of our prey. We did so through developing, to an extraordinary degree, a capacity for mutual aid. As it was essential to our survival, this urge to cooperate was hard-wired into our brains through natural selection. As we face more crises, whether in lack of access to health care, education, housing, food or economic and climate disasters, let’s remember that we have the capacity to meet our needs collectively. 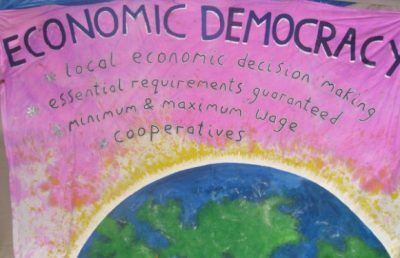 In fact, every day, people are putting in place a new economic democracy that allows people to participate based on economic and racial justice as well as real democracy. As these alternatives are put in place, they may become dominant in our economy, communities and politics and bring real democracy and security to our lives. This article was posted on Sunday, November 5th, 2017 at 11:30pm and is filed under Capitalism, Co-operatives, Culture, Economy/Economics, Energy, Environment, Finance, Greece, Land Use, Neoliberalism, Unions, Universal Basic Income.